Maria Montessori (1870 - 1952) had an educational background based in scientific study. She received a Doctor of Medicine degree in 1896 — the first female in Italy to achieve this status. Dr. Montessori’s early work focused on the children of the asylums in Rome. Through this work, Dr. Montessori, unlike others working with children in the asylums, recognized the children’s capacity for learning. Because of her success with the children in the asylums, Dr. Montessori was appointed by the Minister of Education in Rome to run a school for “deficient” children from the schools of Rome and mentally disabled children from Rome’s asylums. Dr. Montessori utilized the scientific method in order to develop the means for teaching these children. She spent much of her time during each day observing the characteristics of the children. At night, she would write out her notes, analyze them, and make materials for use in her classroom. The following day she would test these new materials at the school. Again she would use her skills of observation to decipher which materials and which lessons appealed to the nature of the children. The children in Dr. Montessori’s first school, despite their disabilities, tested at the same academic level as the children in the traditional schools of Rome. Rather than simply relishing the success of her students, Dr. Montessori wondered what was lacking in Rome’s schools that would allow children of less ability to test at the same level as the more intellectually gifted children from the city’s schools. It wasn’t until 1906 that she would have the opportunity to find the answer to this question. In the early 1900’s there existed in Rome a slum district known as the San Lorenzo quarter. Two buildings housed the poorest class in Rome. It was in this environment that Dr. Montessori made the discovery that would direct her life’s work. During the day, the adults living at San Lorenzo would go off to work, the older children would go to school, and the younger children would be left alone to fend for themselves. These young children, between the ages of 3 and 6 years, began to vandalize the buildings which made up their world. The governing body decided that it would be less expensive to set aside one room to be used as a nursery and to hire a person to take care of these children than it would be to continue paying for the walls and floors to be repainted and repaired. Dr. Montessori eagerly consented to the position of caretaker for these 60 unfortunate children. Within two years, her discoveries regarding the natural characteristics of young children were known worldwide. Dr. Montessori continued to use the scientific method to develop a method not only for educating young children, but also for educating elementary aged children. By the time of her death, she had begun to work on a method for educating adolescents as well. In 1929, Dr. Montessori founded the Association Montessori Internationale (AMI) to establish training centers that would prepare teachers to carry out her method. Montessori, who received three nominations for the Nobel Peace Prize, died in Holland in 1952. Her discoveries regarding the characteristics of the child have influenced scientists, educators, and most importantly, the many fortunate children who have had the opportunity to attend Montessori schools. MariaMontessori.com — a practical Montessori resource for interested parents. The Montessori approach offers a broad vision of education as an aid to life. Montessori is designed to help children with their task of inner construction as they grow from childhood to maturity. It succeeds because it draws its principles from the natural development of the child. The inherent flexibility allows the method to adapt to the needs of the individual, regardless of the level of ability, learning style, or social maturity. Montessori classrooms provide a prepared environment where children are free to respond to their natural drive to work and learn. The children's inherent love of learning is encouraged by giving them opportunities to engage in spontaneous, meaningful activities under the guidance of a trained adult. Through their work, the children develop concentration, motivation, persistence, and discipline. Within this framework of order, the children progress at their own pace and rhythm, according to their individual capabilities, during the crucial years of development. The role of a Montessori teacher is one of guide and observer, whose ultimate goal is to intervene less and less as the child develops. The teacher builds an atmosphere of calm, order and joy in the classroom and encourages the children in all their efforts, thus promoting self-confidence and discipline. 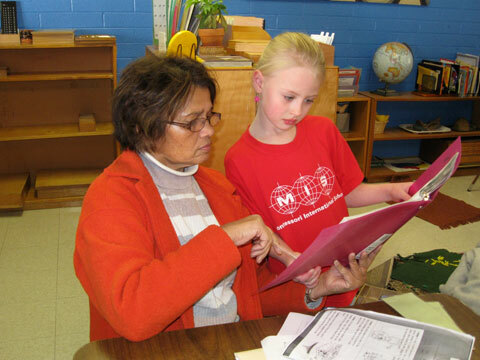 With the younger students at each level, the teacher is more active, demonstrating the use of materials and presenting activities based on an assessment of the child's needs. Knowing when to observe and when, and how much, to intervene is a skill the Montessori teacher develops during a rigorous, specialized course of training at training centers throughout the world.